There are a couple of ingredients that I have fallen head over heels for recently. Little things that completely change the flavor of a recipe. Raw, virgin coconut oil is one of them. In the mid 1980’s soybean farmers in America started a scare tactic campaign against the use of so-called “tropical oils”, imported palm and coconut oil. Full page adds convinced the public that the saturated fats in coconut and palm oils were “poisoning America”, forcing the food industry to abandon the saturated fats and switch to the American-made trans-fats, such as soybean and peanut oil. The trans-fats come from unstable polyunsaturated oils undergoing hydrogenation, which hardens the oil making them more stable. However, the process converts the natural oil into an unnatural trans form that has been shown to increase the risk of coronary heart disease, lead to obesity, increase the risk of type 2 diabetes and result in premature death from complications related to obesity. Palm and coconut oils resist oxidation and are naturally highly stable which means they do not require hydrogenation, making them naturally trans-fat free. A 1988 Harvard University Medical School’s Nutrition Coordinating Center study found that coconut oil does not increase the risk of heart disease. While other studies have found that coconut oil actually reduces the risks of heart disease, cancer, and other degenerative conditions. It has also been known to help prevent bacterial, viral, and fungal infections, because of its antimicrobial component, lauric acid, which is found solely in coconut oil and in breast milk. 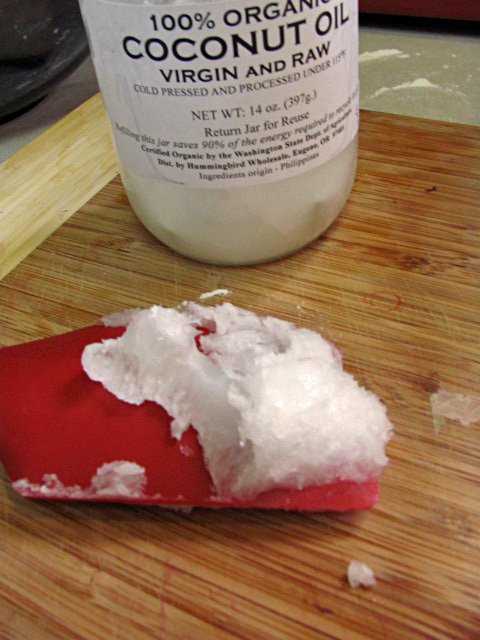 Coconut oil is rich (66%) in medium-chain triglycerides, a fast absorbing energy source that enables the human body to metabolize fat efficiently. MCT’s are used extensively by dieters, athletes, individuals who have difficulty digesting fat, and those with impaired immune systems. Lastly, to debunk all the negative ad campaigns in the 80’s and 90’s, unlike some saturated fats, coconut oil does not raise cholesterol. So, go to your nearest co-op and get some virgin coconut oil. It should be a solid that looks a lot like shortening, but smells way better! I use coconut oil in all kinds of baked goods. It adds a nice mild coconut flavor so its perfect for chocolate or vanilla cupcakes! It can be used with great success as replacement in recipes that call for vegetable oil, since it has a similar melting point and has no effect on texture. 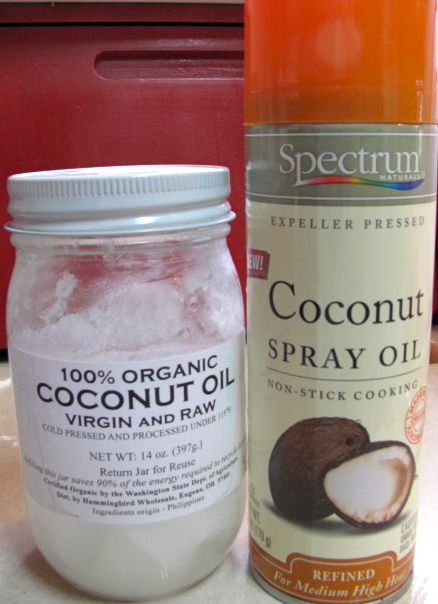 I just recently found the spray coconut oil, which is great to quickly grease a cake pan, though I’m not sure it has the same health benefits as the raw, virgin kind. Whisk together the soy milk and vinegar in a large bowl, and set aside for a few minutes to curdle. Add the sugar, oil, vanilla extract to the soy milk mixture and beat until foamy. Pour into liners, filling 3/4 of the way. Bake 18 to 20 minutes, until a toothpick comes out clean. Transfer to a cooling rack to cool completely before frosting. You can frost with anything, but I’ve been dreaming about using a german chocolate cake frosting. It would be like a Mounds cupcake! This entry was posted in Cakes & Cupcakes, Food Revolution, Vegan baking. Bookmark the permalink. These are amazing! I made them for a party recently and they were a big hit. Oh wonderful! I’m so glad everyone liked them. Just made these tonight for my family and they are fabulous!! A new favorite in our house. We added chocolate chips to half the batch and used coconut milk and they are so delicious-thanks!